The classic era of Doctor Who tended to leave past companions alone once they departed the company of the Doctor and the TARDIS, a few flashbacks and cameos in special episodes notwithstanding. Accordingly, ‘Power Play’- or what was once titled ‘Meltdown’ before real-world scares intervened- feels like something of a precursor to the modern era of the franchise where past companions return with much more frequency and continue to carry narrative weight. As trucks carrying nuclear waste begin to disappear and a nuclear power plant nears meltdown while people are kidnapped by an alien police force, Victoria Waterfield stumbles upon a familiar blue police box as her past and present brutally collide. 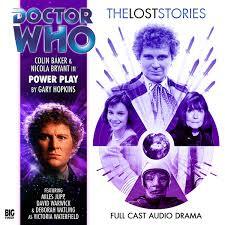 ‘Power Play’ is certainly a story teeming with interesting ideas, and the opening notion of an intergalactic police force coming after the Doctor is a strong one that surprisingly has not previously been used. But as transuranic elements enter the nuclear equation and long-extinct organisms turn up 500,000 years later in the present, it’s clear that the mysterious Dominic has far more nefarious plans than his benevolent claims of disposing nuclear waste so far in the past that it will have no effect on the beginning of life on Earth would suggest. With the multiple storylines not quite dovetailing as might be expected, the Doctor assumes that Dominic is a con man using his time corridor to escape justice as he turns Earth into a bomb, but his chosen profession of planetary assassin and his plan of framing the Doctor for his crimes are superb twists that keep the intrigue and excitement high throughout. In a story that has a clear message regarding the environment and the caution nuclear power warrants, it’s the return of Deborah Watling in the role of Victoria Waterfield that highlights events. Victoria, of course, never achieved much meaningful characterization during her tenure in the TARDIS, and so it’s quite satisfying to see the girl from the age of steel take such a passionate stance against nuclear power so far in her personal future. Unfortunately, anything meaningful that could have been derived from this is undone by having Victoria subjected to mind control. While this in itself presents a good opportunity for drama as Victoria turns against a Doctor she doesn’t fully recognize, the script simply isn’t strong enough with this aspect to warrant the dangerous turn for a beloved character, falling flat when it needs to emotionally excel. Colin Baker and Nicola Bryant do, of course, offer their typical strong performances that hearken back to a time nearer their early televised tenure, but even Peri becomes something of a secondary character later in story. ‘Power Play’ ends up being somewhat disjointed with its final episode trying to piece together the many different storylines to varying effect. Nonetheless, strong direction and sound design temper the rockiness and are able to maintain a solid tone and sense of pace from beginning to end. While the story doesn’t quite successfully delve into the environmental storylines as much as probably intended and none of the characters are explored in any meaningful depth, ‘Power Play’ still manages to entertain and to provide another intriguing look into what may have been had events played out differently in the 1980s.